I will be working with Chris "OverdriveZ" Chénier, owner of the famous http://shortcircuit.simplenet.com, the site that tops all the search engines, in order to bring you the ultimate page dedicated to Johnny Five. We will combine our sites and talents into one mega-site, http://johnny-five.com. There, you will learn everything you could possibly want to know about this great character and the movies. Prepare to be Johnnyfied! 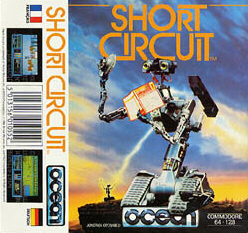 While searching Ebay for Short Circuit related items, I found someone selling a Short Circuit game for the Commodore 64. Why have I never heard of such a thing before? Have you? It's news to me. News of it seems to have even skipped over the film's writers back in 1987 when game company Ocean released it. 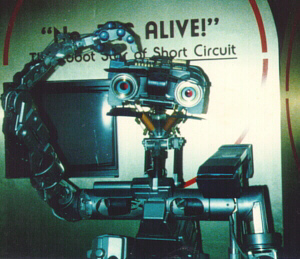 Writer S. S. Wilson mentioned that Short Circuit never made it to any toys or games, but here it is. This is a very rare item. Unfortunately, you can't buy this game anymore unless you are lucky to run into someone like Paul who's selling it on Ebay. The box cover scan below also comes to you courtesy of Paul. I found out that you can download this game on the internet and play it on your PC with a Commodore 64 emulation program, but I also contacted Infogrames, now owner of the defunct Ocean, on the legality of downloading it. "It is NOT legal to download this game," they said. At least not for now. They're thinking about ways to distribute these games themselves so that they get compensation. Be warned if you find this game on the internet, the copyright still holds. I just got my copy of the special edition DVD! It's awesome. Here is a shot from the DVD. Buy it and see Short Circuit the way it was meant to be seen! I'll post a review about it soon, but for now, I'll be watching it over and over and . . .
Johnny Five makes a subtle appearance some 12 years after his last "role." This time, it's just his arm on a table. I was watching Star Trek Voyager on FOX last night and my eyes lit up when I caught a glimpse of something odd lying on a table. "Hey, what's that?" I thought. "It looks kind of familiar. Holy cow, that's JOHNNY'S arm!" Does Eric Allard work for Paramount now or did he let Paramount rummage through his studio for props in this episode? More likely, Paramount requested it specifically for this episode to see if fans would catch on. This episode featured sentient robot beings, so, there's your connection. To find Johnny Five's arm, pay attention to the scenes where B'Elanna is working on the robots' prototype. Look at what's on the table she's working on. Cool, huh? I caught another easter egg in this episode too. B'Elanna says, "I need to check its flux capacitance." For you Back to the Future fans she's, of course, referring to the flux capacitor; The thing that makes time travel possible in Doc's time machine. This episode might be riddled with more easter eggs. Unfortunately, I missed half the episode. I'm going to get it when it comes out on video. For more information about the episode check out this link. It's episode #29 and it's called "Prototype." I knew I had these pictures somewhere! I just found them and thought I would share them. They show me as the happiest nine-year-old boy on the planet. I'm standing next to big J at the California Museum of Science and Industry (now the California Science Center) in Los Angeles, California. I'm thinking, "If only I could climb over the glass fence." I will contact the museum to find out if he is still there. I doubt he is. If you know where he is now, please, let me know. 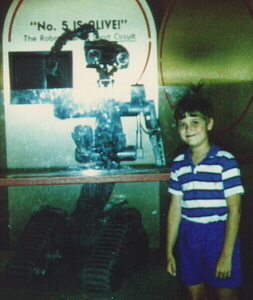 I'd like to visit Johnny Five again! These photos aren't the best quality, I know, but what do you expect. They're 12 years old! This webpage will be dedicated to my favorite movie, "Short Circuit", and childhood hero, the robot Johnny Five. It should be online in October. E-mail me if you want to be notified as soon as the site goes fully live. Don't forget to bookmark this page! E-mail me if you have any fan art, movie scripts, reviews, poll ideas, or anything else so I can have it ready for display when this site goes fully live. Thanks a lot! Short Circuit is finally available in a special edition DVD. The DVD includes the trailer, interviews, behind-the-scenes and more! You can buy it at Amazon.com and many other online stores. I've already bought my copy, of course! Have you? It will start shipping the 19th of this month so get ready!